Even though it's still July, we're already getting misty-eyed over the inevitable end of summer. After all, does anyone ever feel like they've had enough beach time come September? Don't fret if you're all out of vacation days, though — we found an easy way to fake that feeling of a seaside escape. Step 1: Toss on a breezy dress and so-chic sandals. Step 2: Head to Azur, the new Penn Quarter outpost from chef Frederik de Pue. The lofty, light-filled space feels like a swank Mediterranean vacation spot, and the menu is pure delight for seafood lovers. Read on to learn how to make summer just a little more endless. 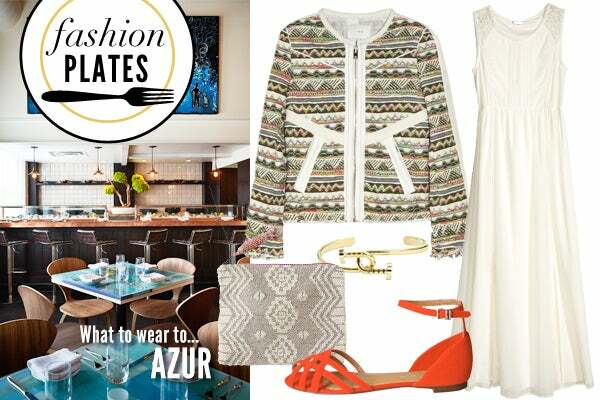 Whether you're craving lunch or dinner, Azur's soothing, sophisticated-beach-house vibe is the ideal backdrop. Grab a sunny first-floor table under the wall of air plants, or head upstairs for a more intimate experience. Wherever you land, you'll want to feel breezy, comfy, and beautiful, so opt for a floaty white maxi-dress and punchy orange sandals, top it off with a printed jacket, and keep your accessories subtle and chic. Now, dig into that lobster roll like it's your last day of summer vacation. IRO Elomi Leather-Trimmed Bouclé Jacket, $764, available at Net-A-Porter; H&M Chiffon Maxi Dress, $49.95, available at H&M; Marais USA Seaside Sandal in Clambake, $50, available at Marais USA; Cara Couture Twist Nail Bangle, $24, available at Nordstrom; Jasper & Jeera Geo Beaded Pouch, $68, available at Anthropologie.